Pop thrush Mari Wilson has caught me napping! Her Pledge Music campaign to fund her new album has less than a fortnight to go and it’s for an album that leverages her pop roots as well as the theatrical work she’s done on the last decade. She’s done recent stage work as both Dusty Springfield in “Dusty The Musical” as well as her own one-woman show, “The Love Thing.” Her new album is a return to the sort of sound that Tony Mansfield crafted for her debut album; retro 60s pop with a modern, electronic sheen. She will tackle the songbooks of not just Dusty Springfield, but also Dusty’s contemporaries like Cilla Black and Petula Clark. It sounds like a natural and the album has a variety of pledge levels for the fans to buy in at. I see Taffy has scooped me here, but I’ll be joining the campaign next week when budget allows. Ms. Wilson has re-connected with a few key players of her Compact Records era this time with Alastair Gavin, her keyboard player from the era co-producing with Mari. My graphic designer’s pulse quickened to see that Julian Balme, who designed the dozens of Mari records in my Record Cell has returned to the drawing table for the perfect cover as seen at left. It’s gratifying to finally get the name responsible for those sharp, iconic Compact Records covers when the house style didn’t give such credits back then. There are a number of pledge points available. Of course your choice of CD or vinyl [both with DL] and more exotic fare like tea towels, rubbing shoulders with the requisite T-shirts [black with the fab cover design, since you asked]. Well-heeled fans may opt in to having their name in the credits for an additional £25 [$36] all the way to the legendary Executive Producer credit, wherein your £1,000 [$1441] nets you thanks in the booklet as well as a personal listening session with Mari and Alastair and guest list [+1] status to attend any of Mari’s concerts this year. While that’s very Hollywood, if I had that sort of cash, the Acoustic House Concert [£1,000] sounds like a fantastic evening for you and as many close, personal friends you can cram into your domicile. Personally, if I lived in the UK the Valentine’s Dinner For Two at The Pheasantry in London sounds like a real bargain at £300 [$432] netting you and one other a three course dinner for two [avec shamponya], a bespoke Valentine’s Day card made for you by Mari herself, a professional photo taken with Mari, a dedication from the stage, and drinks afterward with the artiste herself. It’s almost enough to make one decry a vow of poverty! 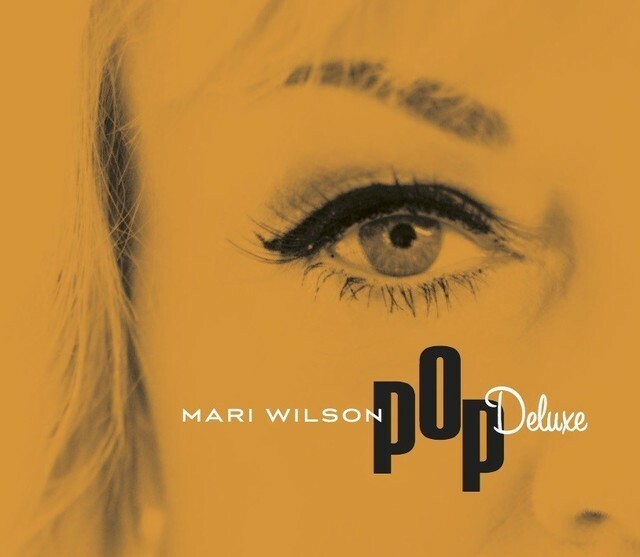 This entry was posted in Core Collection, Want List and tagged 2016, crowdsourcing, mari wilson, Pop Deluxe. Bookmark the permalink. Ha! Didn’t realize it was all public, who’s pledged for what. Yeah, I went for the signed CD immediately, altho that V-Day dinner was mighty tempting. I’m kind of concerned that with just nine days left, she’s only reached 48% of her goal…every other album I’ve preordered thru Pledge reached the goal well before the time frame closed in. Would be a shame if this type of financing didn’t work out, so everyone on the fence…PLEDGE! Taffy – It’s 2016; everything is public! I’ve only pledged three times, and one of those was down to the wire, so every pledge counts! added my two cents…well more like $22, but I am looking forward to this…. I ordered all sorts of goodies. Loving the sound bites at Pledge and can’t wait for the track listing to be revealed! Denny – Welcome to the comments and I will be pledging from my discretionary budget [even a Monk has a stipend] when paid this week. Since I’m all about delayed gratification, I usually skip the previews. Thanks for stopping by!